I had a lot of trouble coming up with today’s post, but then I got into an interesting facebook discussion and will simply edit my comments from that discussion into a unified Post. Q: Both sides have not compromised enough. The problem in this case is that one side is much stronger than the other, and doesn’t need to compromise. They can just get what they want. Especially if the most powerful country in the world supports them (followed by Canada, and Australia and unopposed by the rest of the Western world). Q: Fair enough but the Palestinians have not been good at compromising either. Very little has changed in the past 60 years or so. Here’s my view of the past 60+ years (apologies for the long post, I kept it as brief as I could, and I fear it will be one-sided, but it is hard to be objective in this conflict). 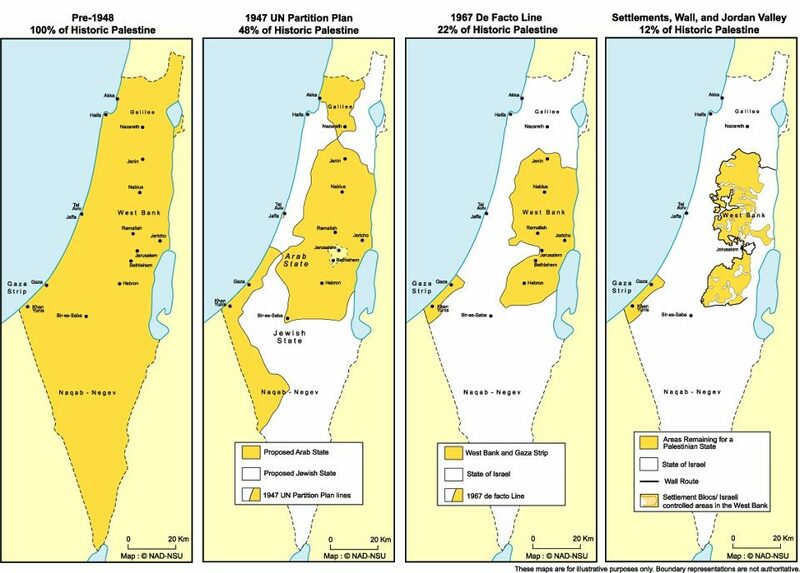 In November 1947 UN decides to divide Palestine in two. Give 55% of land to Jews who are 30% of population. This causes a war in which the Israelis have an army and the Palestinians do not. Resulting in the ethnic cleansing of 700,000 Palestinians (more than half the Arab population), and Israel getting 78% of the land. The armies of several Arab countries do join the fighting in May 1948 after the state of Israel declares independence and they are basically the reason that Israel didn’t get 100% of the land. In 1967 Israel attacks Egypt, Syria and Jordan and captures the remaining 22% of the land (Gaza and the West Bank), plus the Golan Heights from Syria and the Sinai from Egypt (which they eventually give back to Egypt a few years after the 1973 war with Egypt). Israel then starts building settlements on this 22% to make it part of Israel and eventually end up with 100% of the land. A process that is continuing and if not stopped will result in the West Bank ending up like a bunch of disconnected Gaza like prisons. Some time in the 1970s the Palestinian national movement comes into being and there is a drive for a two-state solution. Israel is unwilling to consider it, until after the first intifada when they realize it is too difficult to rule the Palestinians directly. So they signed the Oslo agreement, making the Palestinians enforce security in areas with large Palestinian populations and the Israelis continue to build settlements in the West Bank. In 2000, Arafat is willing to give up the right of return, in exchange for the a state in West Bank and Gaza with East Jerusalem as the capital, but doesn’t accept Israel keeping any settlements. (He insisted that the Palestinians should get the 22% of the land). Israel wanted to keep the major settlements, which the Palestinians thought would cripple their state. In 2005 Israel realizes that having 8000 settlers in Gaza taking up a bunch of land, with over a million Palestinians crammed together right beside, is not a good idea, and they pull out. I am unclear what the border control situation is like immediately after, but once Hamas takes power in Gaza 2007, after the elections in 2006, Israel blockades Gaza, and that leads to the conflict in 2008-9, 2012 and today. 1. 1947 when they didn’t accept the 45% of the land for 70% of the population. And I am convinced that sooner or later the Israelis would have attacked anyways, because their 55% of the land had only a slim Jewish majority (55% Jewish, 45% Arab, vs the Arab 45% of the land which would have been 99% Arab and 1% Jewish, Jerusalem was to have been an international city part of neither state). And 2. in 2000-2001 when they could have accepted Israel keeping the settlements. For most of the rest it was Israel not compromising because they didn’t need to. On a side note is the right of return. The Jews claim a right of return based on a return after a 2000 year absence, but denied every single Palestinian ethnically cleansed the right to come back to their very own homes, from 1948 until today. These are people who still have the keys and the deeds to their houses, which have been taken over by Israelis or the whole villages destroyed or whatever, and if they are no longer alive it is their direct descendants who want to come back but are denied this right. It’s an amazingly racist point of view, which the Palestinians have for the most part accepted as a reality they can’t change. Again I don’t see the lack of compromise. Q: Wait wasn’t it the case that the Arabs rejected the 1947 partition, attacked and then lost? As to 1947-48, between November and April the Arabs carried out terrorist attacks, which were responded to in kind by the Jews. From April to mid-May (once the British had pretty much left), the Jews went on a major offensive. They had an army of 40,000 and the Palestinians had no organized army. Also the Jewish population was much younger, as they had focused on getting as many able bodied young men as possible to Israel. There were several massacres like in the village of Deir Yassin, carried out by the Jews and used as propaganda to get rid of the Arabs. Several hundred villages were destroyed. Etc. Then from mid-May after the declaration of the state of Israel, the outside Arab armies came in and the result of the fighting was the 78%, 22% split. To be fair if the Palestinians did have an army they probably would have done the same thing. They did ethnically cleanse the old city of Jerusalem and the Etzion Bloc of kibbutzim. But my point is the Jewish side knew they would win, it was not a miraculous surprise victory. They had better arms, more men, a real army, etc.